By D Magazine | 9 years ago We had the bright idea of not just chronicling these important moments, but getting the people who made the moments happen to write about them. By D Magazine | 9 years ago In fighting over what deserved inclusion in the 35 Biggest Moments in Modern Dallas History, we kept coming up with events that seemed noteworthy—if not necessarily important. So we endeavored to identify the 35 biggest pop culture moments, too. Because, after all, “Debbie Does Dallas” couldn’t be ignored. By Krista Nightengale | 9 years ago Why some Dallas dentists are now banking stem cells. 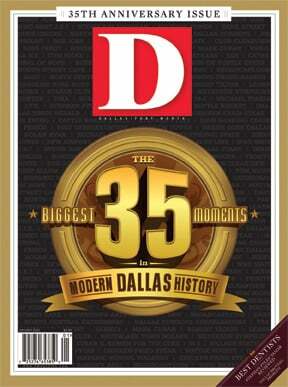 By D Magazine | 9 years ago Twelve iconic structures that have shaped our skyline in the past three decades. By D Magazine | 9 years ago We've had inspired ideas, noble failures, and a few curious decisions. Just like the city we've monitored for 35 years. By Thomas Korosec | 9 years ago Melissa Miles and Lt. Christina Smith devise an ingenious new tactic to shutter Dallas brothels. By Nancy Nichols | 9 years ago While other high-end steakhouses are resorting to gimmicks, Bob’s sticks to the formula that has made it Dallas’ top steak spot since 1993—top-quality meat; sophisticated service; and a cozy, clubby atmosphere. By Nancy Nichols | 9 years ago This crispy chicken is worth braving the rusty drive-through. Just skip the sides. By Nancy Nichols | 9 years ago The all-American, unassuming Lawry's appeases every customer. Well, almost. By Hayley Hamilton | 9 years ago The North Texas, family-run DeLos distillery turns out smooth vodka with a pleasant price tag. By Stephanie Quadri | 9 years ago These one-of-a-kind pieces, available on Etsy.com, can help a lady get the upper hand. By Katherine Lagomarsino | 9 years ago The Green Acres syndrome. Or why a woman would leave New York City for Waxahachie. By Brendan McNally | 9 years ago The onetime Playmate reveals how she survived Hollywood to become the most famous perfumer in all of East Dallas. By Sarah Eveans | 9 years ago When the Rosewood Mansion on Turtle Creek needed an executive chef, it turned to Gert Kopera, the man with the little black books. By Joan Arbery | 9 years ago To most, classical music in Dallas begins and ends with the DSO. But important notes are played outside the Meyerson. By Willard Spiegelman | 9 years ago Doesn’t every curator at the Louvre want a job in Dallas and a McMansion in University Park? Apparently Olivier Meslay did. By Tim Rogers | 9 years ago The D Magazine executive editor learns how to play ball at the downtown YMCA. By Wick Allison | 9 years ago The solution to save Fair Park is simple: lose the pigs and the fast-talking carnies. By Eric Celeste | 9 years ago If the powder is good enough for the best female skier in the world to train there, then it’s good enough for you.